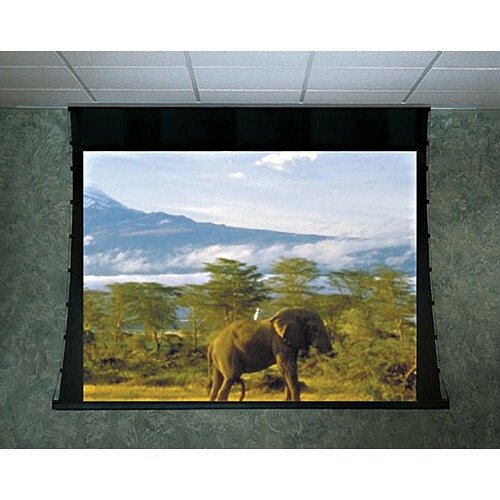 The Draper 52 x 92" Ultimate Access/Series V Motorized Projection Screen gives you the freedom to design a media room, lecture hall, library or corporate boardroom without having to purchase a complete screen system at the outset. The beauty of the Ultimate Access is that you can install the screen "box" during initial construction but reserve the choice of a screen surface until your room is finished. This ceiling recessed screen has a big advantage over other types of screens since it does not commit you to the expense of a screen surface that you may decide is unnecessary down the road. However, once installed, should you choose to change the screen surface at some point, it is a relatively inexpensive endeavor. The flexibility of being able to switch screen surfaces is a time and money-saver. It eliminates the need to buy another complete screen system. The Ultimate Access/V has several remote control options which make it a great choice for schools, lecture halls, libraries and corporate environments. When not needed, the screen retracts neatly into its case, closes up inside the independently controlled closure and disappears into the ceiling. Box Dimensions (LxWxH) 130.0 x 15.0 x 15.0"